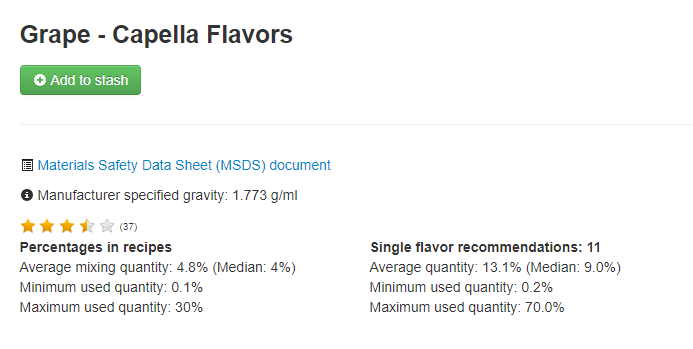 When making 80ML batches at 5% flavor, my calculations always call for roughly 4MLS of flavor (or 4 grams) to make that 5% flavor. For some reason, and it seemed odd, my grams increased nearly double to make that same 5%. I’m trying to figure out why this is so out of whack? When mixing this recipe, I backed off despite calling for 7 grams of flavor and went with slightly more than the usual 4 grams of flavor. But something clearly does not seem right with this calculation. Easy way to roughly check the specific gravity. Use a syringe to weigh exactly 1ml of the flavour and then compare the result to the data sheet. Certainly 7.09g / 4 = 1.77g. I’m trying to figure out why this is so out of whack? You have to decide what your goal is. 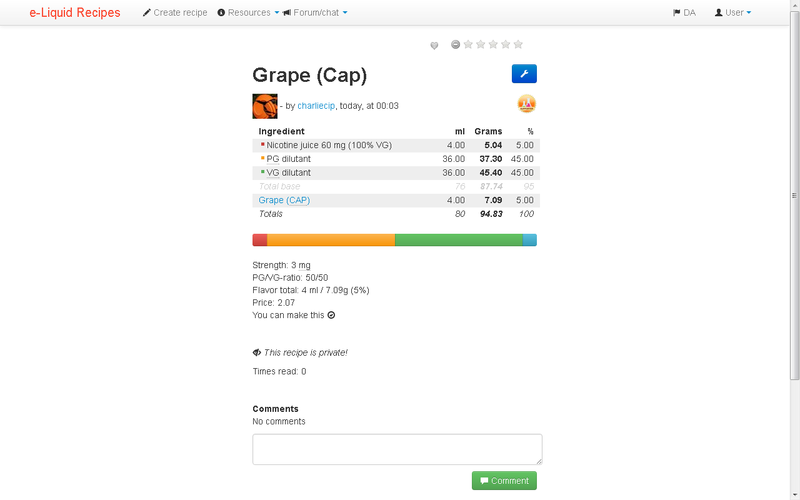 If your goal is to make exactly reproducible flavor profiles batch to batch then you must mix by weight. If your goal is to make exactly a certain amount by volume batch to batch then mix using a calulator like the ELR one. However, understand that there are errors introduced into the formula when using a volume calucaltor like ELR because the specific gravity conversion is not exactly precise. This question comes up all the time. Recently in PM, @ChemicalBurnVictim and I were discussing some Hybrid NET recipes and he protested that my formulation of his recipe as listed in the ELR database was wrong. I pointed out to him that I just wanted to make “a little bit for test” and used the “percentage” as listed on the ELR database. This introduced the type of error you are talking about. So I ran a spreadsheet to help him understand the issue. Here is a copy of that sheet. I might add that in the chemistry lab and in industrial chemistry (a subject I spent 35 years immersed in) we mix by weight because the goal is to exactly and precisely reproduce a formula, the goal is not to exactly and precisely fill a 80ml bottle. I would venture to say you have amazing taste buds to differentiate that outcome. Yes, I never said that these introduced errors is going to be something that you can "taste. You are correct, these seem small errors. However, that is why I broke out the “Flavor Delta” separate from the overall error. So this depends on product flavor intensity/gm and the overall balance of weight of total flavors to total weight of the formula. For example if the formula includes using TA(tobacco absolute), you might find that 1/2% is a lot !!! - In a typical formula where the flavor is running at about 5% of the overall weight of the formula then the Flavor error is about 1/2 a percent. But this error rate will vary with overall balance of the recipe. Another source of errors with conversion calculators like ELR is that the calculator assumption is made that certain items have a certain specific gravity. 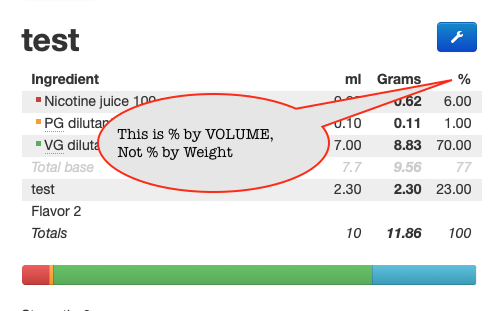 This is a huge leap of faith that the calculator “knows” what, in fact, the specific gravity of a specific ingredient actually is ! How does it know that the “TA” has a sg of 1.1 or that “Black For Pipe” converts at some other rate? It doesn’t, so that is an issue. Another issue with conversion calculators like ELR is that the calculator assumption is made that certain items have a certain specific gravity. 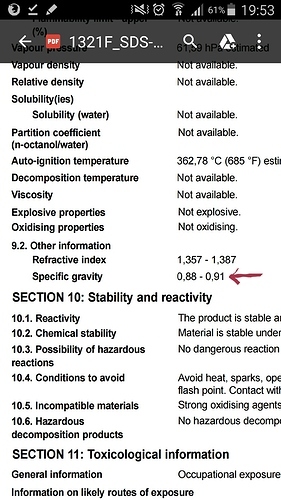 Probably is old this msds with typo? As to MSDS sheets and their truthfulness, that is a subject for another thread, but I can tell you as one who wrote dozens of them as part of my daily job, they are fudged to the extreme. There are many reasons for that. I worked for a company that had to protect its proprietary products from knock offs by competitors. 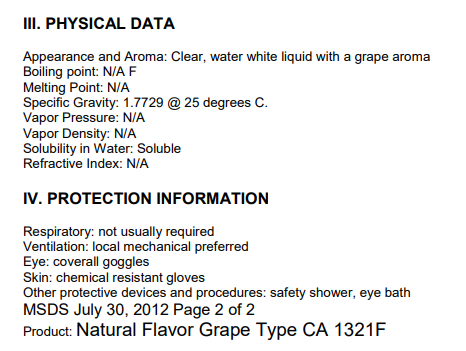 The MSDS sheets were carefully crafted to hide the real data. 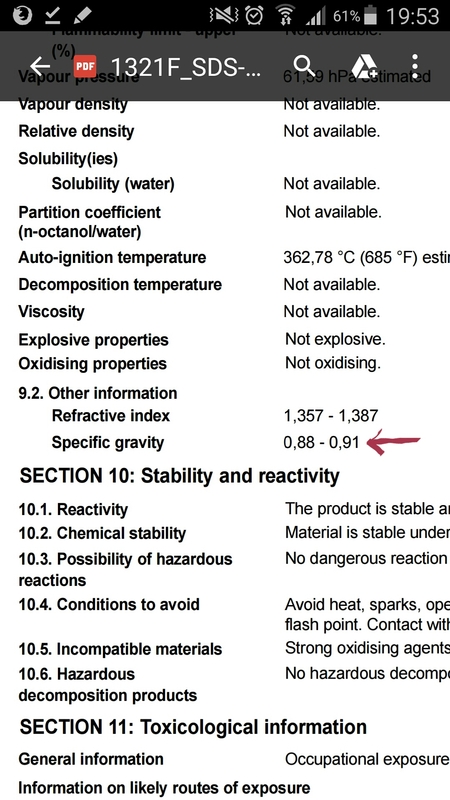 Cool maybe you can update the data.I went with the MSDS related to the calculation. I am sure there are a lot more like you show. Thanks to this post, I now have another PG-free Grape to use! Glad you got the proper specific gravity. I was about to post the same screenshot of the data sheet! Depends on how you look at it. I think it’s obvious that the % is by Volume. 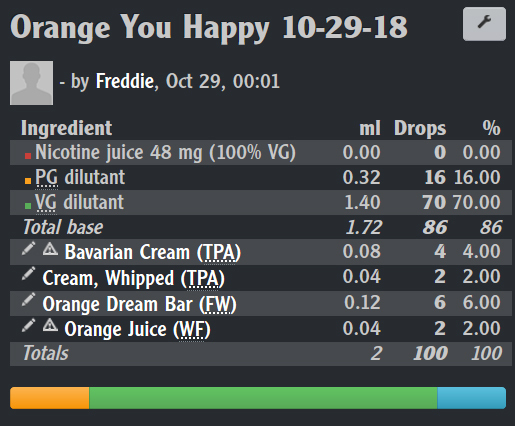 I Mix by weight and only count drops to see how off-or-on my drops are per bottle. So I like displaying my recipe calculator formatted like this. Looking at it this way it’s clear-as-day, no confusion whatsoever. Plus all bottles drop different weights per drop. You have to draw the line somewhere to have a functioning calculator, you just can’t account for everything. I can not update the data on ELR calculator side. The only way of doing this and keeping it as accurate as possible for your personal mixing is the option under the settings/profile menu. There you can click “use manufacturer specific gravity” if that’s enabled it will use it. If not marked it won’t use it. but here’s the issue, you would then need to go in and set the weight yourself for every flavor, otherwise it takes the default of 1.0038 which it does anyways for the flavors that don’t have info from the sheets. This does open two problems so, if you let’s say want 3% lemonade, in cases where ppl use the manufacturer weight, this recipe will be different from yours. Now we can argue that .o2 g is not much to notice, but unfortunately for some flavors it’s noticeable. 2 drops or .04g of rich cinnamon will taste different then 1 drop - .o2 g of the same flavor. It only matters when you sharing your recipes, if not, then using option A or B is irrelevant. Just pick what you want to do, over organize everything and be accurate down to the tiniest drop, or laid back and have the numbers put in the calculator by somebody else. Yes. Your observation is exactly correct. This is where I ran into big problems with the ELR system. As per my first post describing when @ChemicalBurnVictim and I were communicating about some NETs that have very high density ingredients, immediately this issue surfaced. I mix with a scale accurate to 1/10 gram. I really see no reason to mix by volume, constantly dealing with SG conversion issues.